What is it with me and the cake pops? This is my second attempt at making these delicious little treats. When it comes time to dip them in the candy coating things seem to go awry. The cake falls apart or completely comes off of the stick and the candy starts clumping. 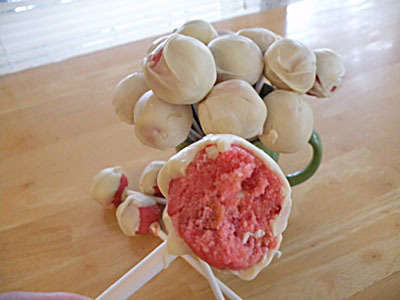 I never have these gorgeous, smooth cake pops that I see all over the land of blog. What gives here? I so desperately want pretty cake pops! I have tried different techniques to attempt to achieve this. I have made smaller cake balls, I have used less frosting mixed in the cake, I have switched to a better quality candy coating, I have dipped and not dipped the stick in the candy coating before placing the cake ball. Whew, so exhausting! But here is the thing, if you can manage to keep the cake ball on the stick, (duh), which I did by not completely dipping it in the candy coating, then they will still taste very, very good! Cook cake according to package directions. Let cool. Crumble cake into a large bowl. To make the frosting, mix the cream cheese, sugar, butter and vanilla until smooth. Using a half cup at a time, mix into the cake crumbs. Use only enough frosting for the cake to stick together and form a ball. 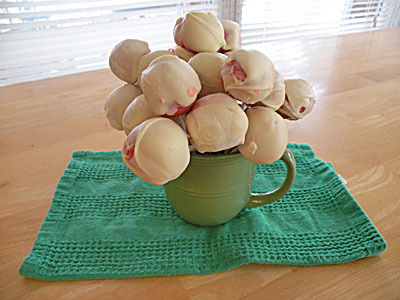 Start forming cake balls, making them a little smaller than a golf ball. Place on a cookie sheet and into the refrigerator for about 15-20 minutes. Meanwhile, melt white chocolate or almond bark in a double boiler. Set up an assembly line, candy sticks, cake balls, candy coating (removed from the heat), and Styrofoam. Dip the end of the stick into the candy coating, then attach a cake ball, then dip the cake ball into the candy coating and place into the Styrofoam block to hold steady until candy sets. Enjoy! This recipe makes 35 cake pops. 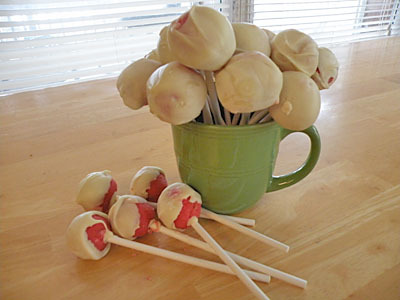 I stil have not tried to make cake pops. I am sure my boys would love them but I would have to quadruple your recipe as these bite sized treats would go quick. I totally get that! I guess I should mention how many this recipe makes, huh?! Thank you! sure it’s yummy.Thanks for the tips. I had to smile when reading your post. I never have much success with dipping cake pops either. I am much better at frosting an entire cupcake. Yours look delish tough! So there is someone else! I am seriously thinking about pressing it into a cake pan next time and pouring the candy coating over it…..it’s just so darn good! Yes, that is about the way it went for me, lol!